I reached Jo Mary Road today. My cache of food and bug spray hung undisturbed. An animal had not ransacked the food bags and a human had not discovered the precious bug spray. Caching food at Jo Mary Road in the middle of the 100 Mile Wilderness was risky. 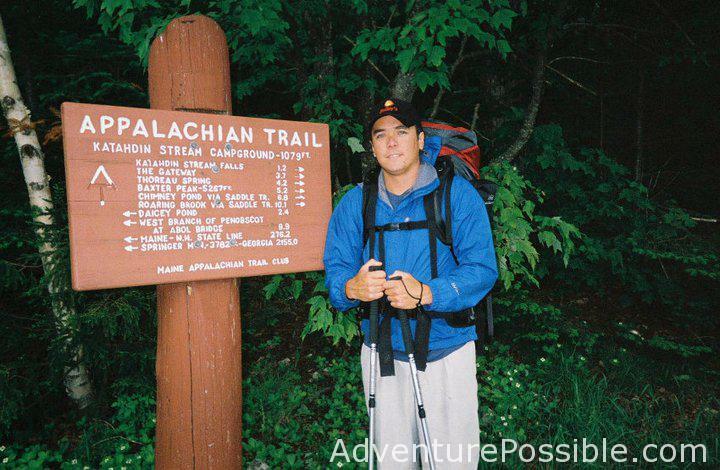 It was risky driving miles and miles down a poorly maintained logging road to find an intersection with the Appalachian Trail, and it was risky to bet that the food would be waiting for me when I arrived several days later to retrieve it. I’m not exactly sure what I would have done if the food had been lost, probably taken a direct route back to Katahdin stream campground. But the risk paid off. The food was hanging in the tree where I had left it, and I was able to reduce my pack weight in the first part of the trip and allow me more luxuries in the way of heavier snacks and bug spray because I had stashed the supplies ahead of time. Returning to Jo Mary Road saddens me. The tire tracks from the Chevy Malibu that Mom and I had rented were perfectly clear in the dirt road. I saw the tracks of the wide U-turn we made after finding the trail and then the spot where we parked. My eyes watered when I found a card that she had hidden in my backpack that I hung in the tree. I certainly do miss home, not necessarily because I’ve been away for a week, but because I won’t meet any friends or family for months, probably not until I get to Maryland. I miss everyone at home and the desire to return is great indeed, but first I must finish this trip that I have started. I’ll eventually be joined in the mountains by friends and family. For that reason, it’s in my interest to move forward as quickly as my body will let me, yet my body hurts. My right knee is giving me terrible trouble. I wrapped it today with an ACE bandage. I wrapped it yesterday also. Today the knee performed better, but both my Achilles tendons hurt when I take long steps. My boots pinch down on the tendons and the pain causes me to cry aloud. The pains will hopefully subside. I think I am going to lose my left big toenail. I drag my right foot when I walk because of my aching knee, causing me to stub my fragile toes on roots and rocks that complicate the trail. My big toe usually takes the full force of the collision. The toenail is tender, raised, and purple. I didn’t hike as far as I had planned today. I am supposed to be sleeping at Cooper Brook. Instead I am still at Jo Mary Road, camping where I thought I had seen a green tarp tent pitched last week while here. The green tarp actually covers supplies and tools for trail maintenance crews. Once I found my cache intact, I was so relieved that I lathered my body in bug spray, snacked on beef jerky, and napped in the hot afternoon sun. It felt so great to lie in the sunshine after being in the bogs and the bugs for four days. I even got the chance to partially dry my boots. Once I awoke, I decided I’d hike the remaining three miles tomorrow. Tomorrow is supposed to be my day off, but I don’t need all day to sit around at the lean-to. Cleaning my gear will only take a few hours, and then I can sit lazily on the rocks or in my sleeping bag and doze in and out of much needed sleep until the next morning. By the time I had reached Jo Mary Road, I was tired. Since I didn’t have bug spray today, I hiked the eight miles through the swamp with only one water break at a murky spring. The bugs are so bad that stopping is completely out of the question. My hands are even more knotted and swollen than yesterday. Damn mosquitoes! The only purpose I fathom that they serve in this world is as food for frogs and bats. They contribute nothing else beneficial to the ecosystem, and they make my time significantly more miserable. I could deal with wet clothes, swollen knees, and groin chaff for weeks, but mosquitoes make rest on a rock seem like torture on the rack. Last night I escaped them by hiding in my tent. I fell asleep with hundreds boring their beaks through the mesh panels. I woke up and noticed only a few still lingering. I assumed it would be safe to venture out for breakfast, but as soon as I unzipped the tent, they released from the walls of the lean-to with a buzzing fury. They had waited all night for me. I rushed back into my tent with a bag of cereal. The mosquitoes followed. I killed every single insect trapped inside my tent before slurping down a bowl of powdered milk and cornflakes without a spoon. Speaking of this morning, the most annoying woodpecker arrived at first light to search for grub. It sounded like a jackhammer when his beak hit the trees, but it sounded like a machine gun when he banged his beak on the lean-to’s tin roof. The noise forced me to rise to a sunny Maine sky at probably five o’clock. I originally wanted to sleep in late. My body constantly needs recharging through sleep. Today I made one major mistake while hiking. At a place called Mud Pond, I crossed a logging road. I quickly determined that the road was not Jo Mary Road and I moved on. Soon I doubted myself. I remembered Mom telling me the road would look different when I can upon it by trail. After about a half mile of internal debate and mosquito slapping, I decided I needed to know for sure. I dropped my pack and headed back to the road, a one mile round trip backtrack just to discover that I had been right. Of course, I found the good in the situation because now I knew that, from where I had dropped my pack, Jo Mary Road was only another mile or so. I thought I would be able to move more quickly without my pack, but I could not. My knees hurt just the same and I still dragged my right foot. While backtracking I realized how severely I was dragging my foot. I saw my tracks in the mud and pine straw where my right foot had scraped the ground for a couple of feet. It seemed that my right boot had not left the ground for nearly a mile. I am going to bed now without dinner. I really want to sleep. I am sleeping alone again, but I am comfortably tucked away in my tent. I saw no one today, and that makes two days in a row!